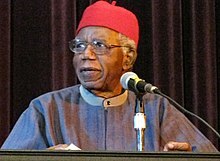 Chinua Achebe (born Albert Chinualumogu Achebe; 16 November 1930 – 21 Mairch 2013) wis a Nigerian novelist, poet, professor, an creetic. His first novelle Things Fall Apart (1958) is an aa conseedered his magnum opus, an is the maist widely read beuk in modren African leeteratur. ↑ Franklin, Ruth. "After Empire: Chinua Achebe and the Great African Novel". The New Yorker, 26 May 2008. Retrieved 7 December 2010.